The younger town is much more of a touristy party town and we went there only once, for the whale watching tour. That was enough. I didn't like the feel of it at all. In contrast, we walked to San Jose del Cabo several times. Yes, it's still touristy, but much quieter. The historic district has some lovely old buildings and interesting architecture. The Jesuits established a mission in San Jose del Cabo in 1730. I wasn't able to discover when the cathedral was built, but much of it was destroyed in the 1918 hurricane and the building you see now was reconstructed using portions of the old walls. 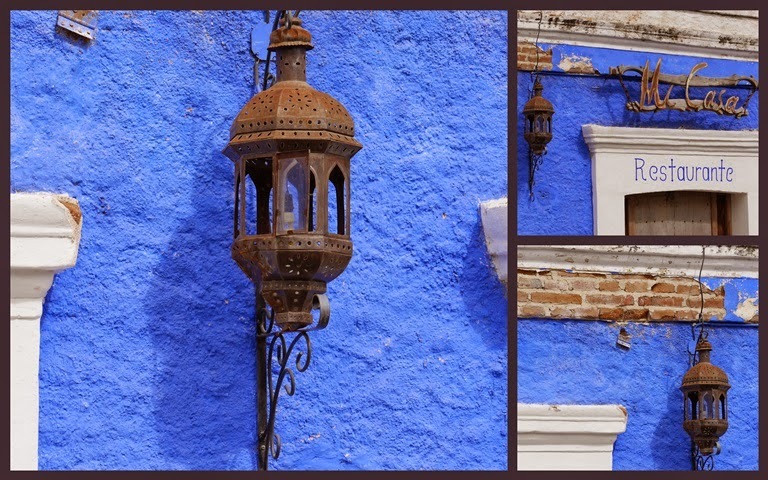 The colourful painted walls in the historic district are enhanced by the strong light. Beautiful ironwork railings, lamps and doors add to the beauty. I think I'd prefer the less touristy areas, too. Lovely shots of the cathedral against the sky. 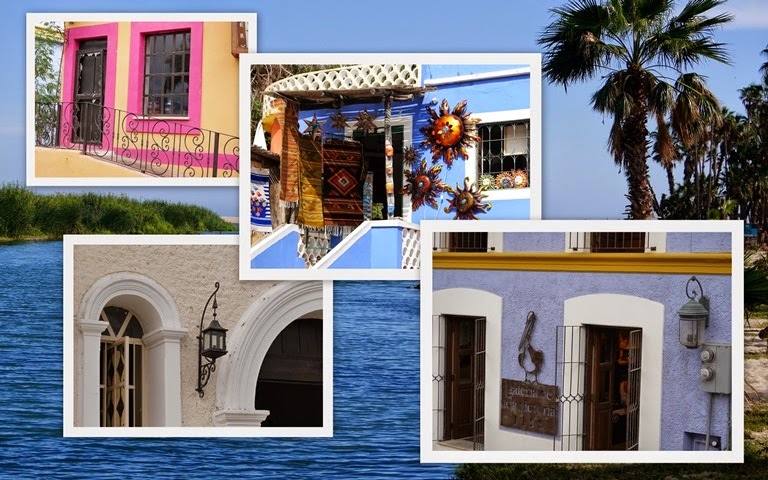 Wonderful architecture, historic mission and blue water - a nice area to vacation in. There used to be the ruins of an old Spanish mission near my grandparent's home in New Smyrna, Florida which was always fun to explore. I've never visited Mexico, but after seeing your photos I want to go someday. This area looks lovely, Lorrie. Very pretty buildings and I really like the wrought iron trim and lamps. We've never been to Mexico and will probably never go so it's nice to see this historic side from a tourist. :) I hope you have a good week ahead. Isn't it interesting how towns have personalities and some we like and others not so? I enjoyed seeing your photos of beautiful architecture and that deep blue water. Lovely photos - it seems like a perfect spot to get away from it all. The cathedral towers are beautiful. Lovely scenes from your Mexico trip! Thanks for sharing your visit, have a happy new week! I love that you are sharing your trip with us. My eye went to the blues immediately, Very pretty, very restful. You need to find a warm place where there are no tourists, but all the amenities...rather ridiculous economically, but it would appeal to me. I would love the historic town! Great photos! I would love to visit the older town! What a lovely place to visit, Lorrie, and you've shared such colorful photos. I just came back from the Cancun area in Mexico. It was a wonderful time with17 other ladies. I have never been to Mexico but you are making me dream of taking a trip! So beautiful. I am happy to know that you had a good experience in Mexico. We used to go there (when we lived on the west coast) and have spent time in puerto Vallarta at a resort. But that all has been years ago ... We loved it so much, but one hears such sad and terrible stories lately. It makes me happy to know you were able to walk to this village. Beautiful Lorrie! Give me an historic district over a touristy area anyday!! That mission cathedral is so interesting. Lovely photos. Loving the brilliant blue color. I'm glad they are restoring the damaged cathedral, such pretty bell towers. Did you get to hear them ring? Your mosaics are wonderful, Lorrie; I hope you have a great week. Beautiful! The colors are beautiful, especially that intense blue in the first photo.